The “DKV-006-002” Shutter Kit includes a “DMCV-006-002” card and 6 “DMI-006-001” identification modules. The Shutter Kit can be used to configure up to 6 blinds, curtains or shutters and 36 push buttons (PB). Each of the shutters is controlled by a PB for raising and a PB for lowering. • A brief press will activate lowering or raising for the time set in timer mode. A further brief press will stop the blind. • A long press will activate lowering or raising until the blind is in the required position. If the installation comprises 12, 18, 24 blinds, you can connect several “DMCV-006-002” cards. Lowering Mode: this function simulates a classic blind-lowering command. Raising Mode: this function simulates a classic blind-raising command. Timer Mode: this function can be used to set the blind's lowering AND raising time. Group lowering mode: management of 2 blind lowering groups. Group raising mode: management of 2 blind raising groups. Number of outlets available: 12 bipolar contacts with 8A of free polarity and replacable (2 contacts required per blind). 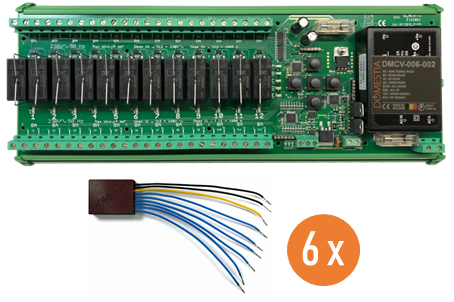 Identification module bus: 10VDC on 2 non-polarised wires. The module bus must be different from the Starter Kit bus!